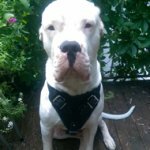 Choose the strongest and the most comfortable for your pet Amstaff muzzle! 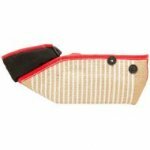 Our American Staffordshire Terrier muzzle is a perfect solution for safety daily dog's activities beginning from the walking and visiting the veterinarian to obedience training and dog sports exercises. Each of our dog muzzle for Amstaff is made in different sizes so you can get the best one that fits your beloved American Staffy perfectly. 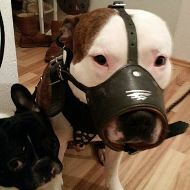 If you aren’t sure of the size and model of the Amstaff muzzle fell free to write to us. 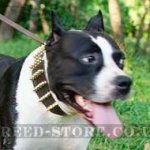 Moreover, we can discuss the possibility to add any options to the American Staffordshire Terrier muzzle on demand if the chosen one doesn’t satisfy you completely. 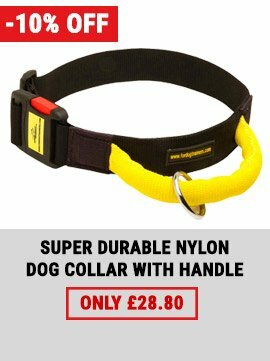 Nice offer for Amstaff owners! You get 10% discount on all the products from this page! Just put the coupon code 7788 into the coupon field when making your online order. The American Staffordshire Terrier called Amstaff or American Staffy is a very muscular and powerful dog breed of middle size. Despite of their menacing look American Staffies are very friendly and like playing with children. These smart dogs are well-trained and can win many awards at different dog shows and gain the best results in dog sports such as weight pulling, agility or canicross. But the owner must show who is the leader of the pack, otherwise Amstaff will become a leader that may bring unpleasant behaviour problems. American Staffy should be definitely socialized to rule out aggression. Making new canine friends, walking in the parks and along the streets, training must be safe for your Amstaff and surroundings. 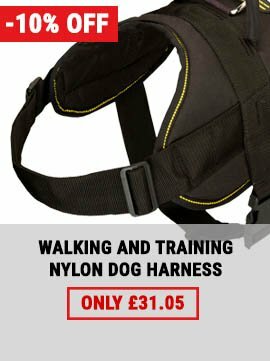 Besides some countries have a law that prohibit owners from walking their dogs without a muzzle and a lead. 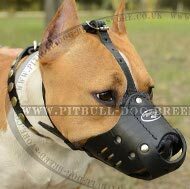 That's why American Staffordshire Terrier muzzle is a must-have for your pet. 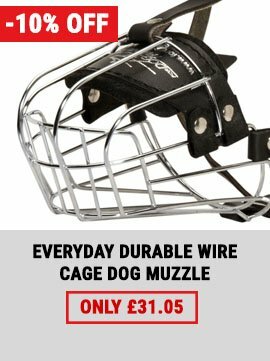 Our Amstaff muzzles special design doesn’t hinder the in breathing but prevents biting, picking up things from the ground and licking. See also our best-seller basket dog muzzle and royal padded dog muzzle for your Amstaff. Show your patriotism with our Union Jack painted dog muzzle.